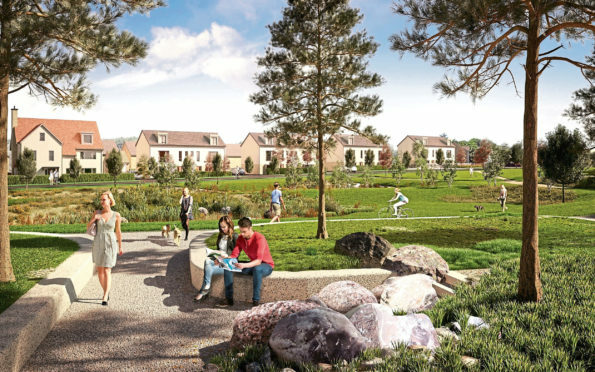 With big changes afoot for the company next month Stewart Milne, its executive chairman, said he felt the group was “moving into a new phase”, and aims to double the number of homes it produces each year. It was announced in early 2019 that the business’s chief executive Glenn Alison will retire in March after 30 years in favour of chief operating officer Stuart MacGregor. Mr Milne said he saw this as an opportunity for the business to move forward. “In some ways the last 10 years have been quite challenging,” he said. “After the crash in 2008 and then the oil crash in 2014 it has been a challenging period but we see fantastic opportunity moving forward. “We are in the process of rebuilding our senior team within the group and developing strategic plans for the next five to eight years. “We, from a personal point of view, see it as an opportunity to really drive hard over the period. Mr Milne said he saw more chances for the business to build on operations in central Scotland and England and to expand in Manchester. But a main focus would be expanding the timber frame and offsite construction business. He added: “We have also got ourselves extremely well positioned in the timber frame market. “We have a clear number one position in the UK at present. “In Scotland over 85% of homes built are timber frame or some sort of offsite construction. “In England that figure is sitting at 15-18% and that is a huge market and we definitely believe the opportunity will be there for us over the next five years to double our capacity. Mr Milne believes business will also be boosted by the pick up in market activity and claimed now is the best time there has been to buy. He said: “I think we’ve started to see the market has definitely bottomed out during the last quarter of 2018, in terms of the level of activity in both the new and second-hand market which have started to move upwards. “I think we will see that continuing during the first quarter of 2019. “It is still a relatively slow upward trend but as we move through the year that’s going to accelerate, and in many ways this is the most opportune time there has been in a long, long time for the house-buying public. “It’s a good time for first-time buyers to be coming in now. “They are coming on to a rising market; it has hit a relatively low level in comparison to where we have been. The 68-year-old doesn’t think Brexit is likely to topple the market any time soon. He added: “I think it has a marginal effect at the moment in that it creates that level of uncertainty. “I am a great believer that most people are pretty good at dealing with what they know they have to deal with. “The thing most people find challenging is when there is a level of uncertainty about what the future holds and without doubt it’s in everyone’s interests to get a decision made and some form of deal done. “I would still remain confident that will come about in the timescale currently being looked at and whatever the deal ends up being there will be implications from that. “But some people will start to understand what these are and then set about dealing with them. “To me the critical thing is, hopefully, end of March there is a deal done and we can start to move forward from there. “I don’t think anyone is under any illusions that whatever deal is done is going to throw up challenges for individuals and for businesses. “There is a capability out there to understand the challenges and to establish what they are, but we don’t see it as having any major detrimental effect on the housebuilding industry.